Italian professional football player who is known for his work as a midfielder on the Roma club in the Serie A league. He is also known for his work as a midfielder on the Italian national team as well. He began his youth career playing with the Roma club in 2007. He then made his senior career debut with the club in 2014. In 2015 he played a short stint with the Sassuolo club before returning to Roma in 2017. That same year he also made his debut with the Italian national team. 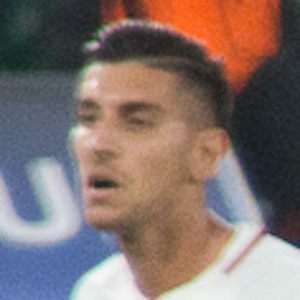 On June 19, 2017 he scored Italy's first national goal in the 2017 UEFA European Under 21 Championship with a bicycle kick which led to a win over Denmark's national team. He was born and raised in Rome, Italy and is married to Veronica Martinelli Pellegrini. He played alongside Salvatore Sirigu and Emerson Palmieri as part of Italy's 2018 national team.